After the GOP-led attempt to repeal the Affordable Care Act failed last week, much of the attention focused on less than a handful of GOP Senators who voted NO on the disaster of a bill. It’s fair to give them props for taking a stand when it mattered. In that same vein, every single person who took time to make a call, join an action, show up at a townhall to defend healthcare deserves our gratitude. The wave of folks around the country who carved out time to take action for our healthcare deserve the praise and attention given freely to the Senators who heard their calls, rally chants, and powerful stories. There are new activists to the cause for healthcare justice, heroes in their own right for being brave and trying something new. Then there are those who have been fighting like hell for years to defend programs like Medicare, Medicaid, and Social Security. Threats to these beloved and successful programs are nothing new to them. They saw it coming because they have never stopped fighting this fight. Ladies and gentlemen: it’s time to talk about retirees. They have made it their business to protect everyone’s healthcare. They are a force to be reckoned with and deserve all of the applause. The California Alliance for Retired Americans (CARA) has been at the forefront of this fight to protect access to healthcare for millions. They organize actions, marches, and Flash Mobs! They show up to speak with elected officials, ask tough questions, share their stories and hold them accountable. That’s what happens when you work union and then retire. You never stop being organized. CARA has coordinated and joined dozens of events throughout California this year. 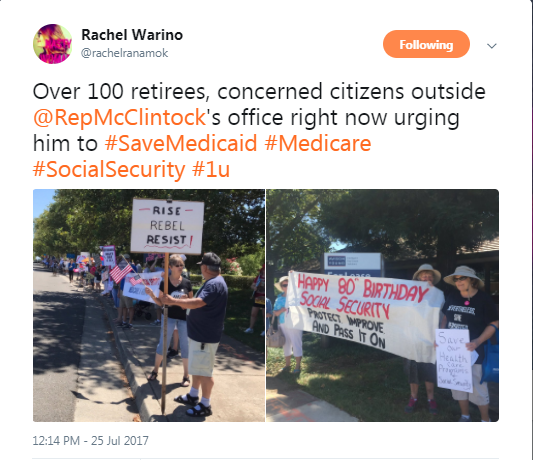 Just in the past few weeks, hundreds of retirees have been showing up at local offices of Members of Congress to urge them to celebrate the 52nd Anniversary of Medicare and Medicaid and the 82nd Anniversary of Social Security. Let me say that again: HUNDREDS have been showing up in Redding, Roseville, Visalia, Fresno, Vista and more. August 8 at 12pm: Rep. Jeff Denham’s office in Modesto. Address: 4701 Sisk Road. August 8 at 10am: Rep. Dana Rohrbacher in Huntington Beach at Orange and Main Street. For folks in the Bay Area, a massive action is planned for August 14 at 12pm at Frank Ogawa Plaza (14th and Broadway) in Oakland. Come out and show your support for Medicaid, Medicare, and Social Security!